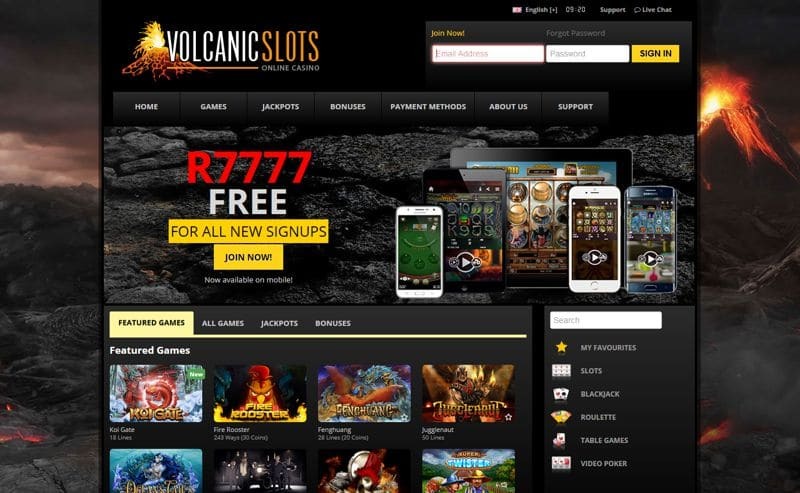 Volcanic Slots Casino is an exciting new online casino that introduces South African players to a completely new and modern casino gaming platform. All the casino games at Volcanic Slots are designed using the new HTML5 coding format which allows all them to be easily loaded onto all modern devices. So, whether you’re playing on your PC, smart-phone or tablet you’ll be able to play your favourite casino or slot game without any hassles. Volcanic Slots is operated by Volcanic Interactive and is licensed in Curacao. This site offers great security and uses the latest in SSL encryption technology as well as numerous other measures. The gaming platform is provided by Habanero Gaming, so players can be assured of a fair and secure gaming experience. Get R250 Free & up to R7,777 in bonuses across your first three deposits. 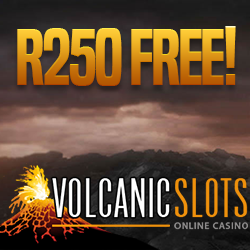 Volcanic Slots offers its players an exclusive R250 Free No Deposit Required bonus. All the player needs to do is create an account, verify their email address and then select the bonus from the list of available bonuses in the Bonuses section of their website. The coupon code for this bonus is SLOTSR250, for those players who would prefer to enter in this code manually. Volcanic Slots also has a Welcome Deposit Bonus which offers up to R7777 on three deposits. They also have a great range of bonuses on offer for each day of the week, so there is always something to enjoy at Volcanic Slots. Every Thursday at Volcanic slot players can claim a 100% matching bonus up to R5000 on their first deposit (Coupon Code THU100) and then keep going with a 50% bonus up to R2500 on their second deposit (Coupon Code THUR50). Unique deposit bonuses are added each weekend and players are notified via their registered email address. Volcanic Slots currently has around 69 various slots to offer with unique themes and graphics. 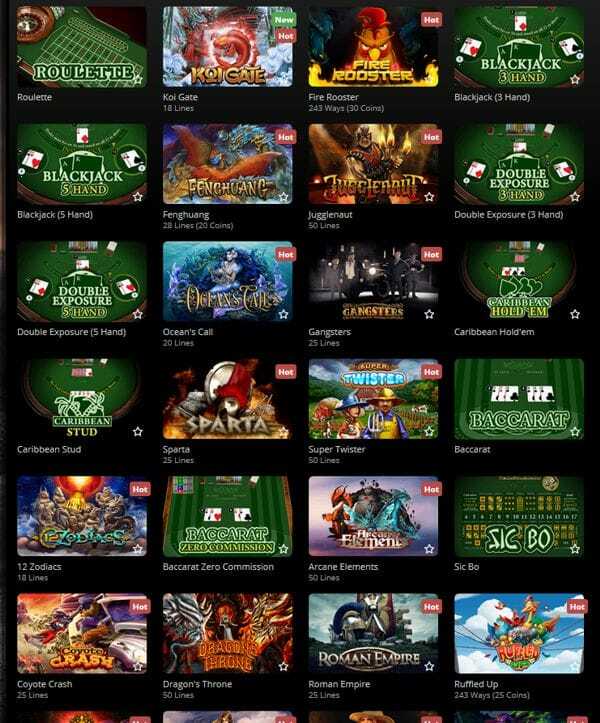 These high-quality slots offer an intense gaming experience with the latest HTML5 coding technology for mobile devices, tablets or instant play on pc. This design has resulted in fast loading times with minimal strain on the player’s device. There are new games added almost every month and their players always have something new to experience. Each slot game at Volcanic Slots offers three different Progressive Random Jackpots which can be triggered on any spin. No need to get any specific combination to trigger the Mini, Minor or Major Jackpots. These can be won by any player playing on any denomination. Volcanic Slots also has a great selection of parlour games to offer with a very decent variety of Video Poker and Black Jack variations as well as specialty games such as Sic Bo, Baccarat, Hold ’em and Roulette. Volcanic Slots offers seamless play on a very large variety of devices. The games on offer have all been created in HTML5 meaning that play is done through the website browser, so if your mobile device, tablet or PC has a browser such as Safari, Google Chrome or Mozilla then it is compatible. One can enjoy this site on your Apple, Android, Blackberry or Microsoft device. This is a great site you can literally play from anywhere. Volcanic Slots offers its South African players the ability to deposit using VISA, MasterCard, Easy EFT, Skrill and regular Bank Wire (EFT) from their local banking accounts. When cashing out the player can request payment back to their VISA credit card, to their Skrill account or request a Bank Wire (EFT) directly to their banking account. Withdrawals are processed promptly and reliably on each working day of the week. Players from South Africa deposit, play and cash out in South African Rand (ZAR). There is no currency conversion at any point. Volcanic Slots uses the highly-acclaimed Habanero Gaming Platform. This relatively new and already very popular provider uses the latest in coding technology to offer a great variety of high quality games which are compatible with an almost unlimited selection of devices. The software is designed with usability in mind and offers a very simple and easy to use interface. With all the games created using HTML5 the player can enjoy an incredibly immersive and high quality gaming experience through the website browser on their mobile, tablet or PC. If your device has the Safari, Google Chrome or Mozilla browser you can play at Volcanic Slots. Loading times are also vastly improved with the games loading effortlessly across all devices. Players on PC can also make use of some unique features such as being able to resize any gaming window on their screen to any desired size and then playing multiple games at the same time. Volcanic Slots is highly recommended. The sleek interface of their website is quick and loads effortlessly. The games also load very quickly and offer a great quality of play with impressive image and sound quality allowing the player to enjoy an exciting and immersive gaming experience. With new games being added almost every month there is always something new to enjoy. This casino also offers a great selection of bonuses to suite any player and the compatibility of their software across devices places them ahead of many of their competitors. We would recommend that players take advantage of the exclusive R250 no deposit bonus and experience the next evolution on online gambling.